Schedule of concerts happening at Skidmore and in Saratoga including Ember Swift at Caffe_ lena. 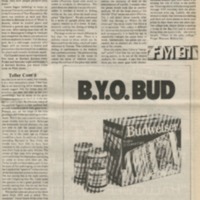 In the advertisement it mentions that Ember Swift has frequented Falstaff's during Lively Lucy's. 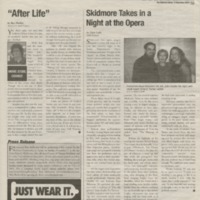 Schedule of concerts at Skidmore and in Saratoga including Lively Lucy's Folk Fest on 4/20/03. "What is so Lively About Lucy's?" by Jenny Sheffield. 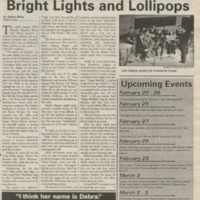 An article about Lively Lucy's and the many shows and events that the club puts on. "Ember Swift Makes Quick Work of Falstaffs" by Erin DeCou. Review of a performance by artist Ember Swift at Falstaff's. The show was hosted by Lively Lucy's Coffeehouse. 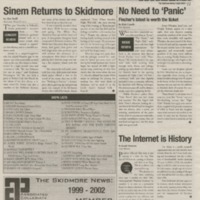 "Sinem Returns to Skidmore" By Alex Wolff. 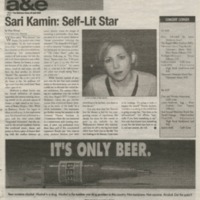 Article reviewing a show at Falstaff's. A performance by Sinem, a Skidmore graduate. The article mentions that Sinem would be playing at Lively Lucy's Folk Festival. 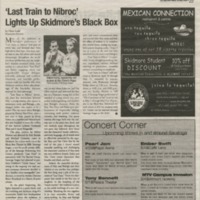 Article discussing the Skidmore music scene and mentions Lively Lucy's as a group that brings many folk musicians to campus. 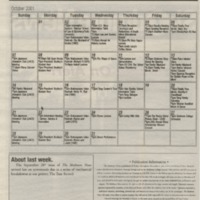 Calendar events at Skidmore including a listing of Lively Lucy's Coffeehouse Thursday the 4th. 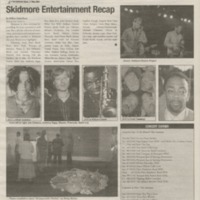 Calendar of events at Skidmore including a listing of Lively Lucy's Coffeehouse Friday the 5th. 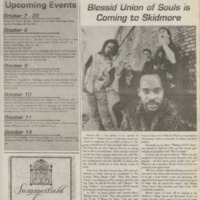 Schedule of concerts at Skidmore and in Saratoga including Peter Mulvey performing at Falstaff's hosted by Lively Lucy's. Schedule of concerts in Saratoga including Peter Mulvey performing at Lively Lucy's Coffeehouse (Falstaff's). 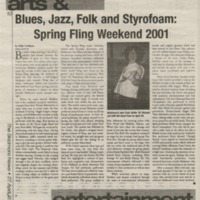 "Blues, Jazz, Folk and Styrofoam Spring Fling Weekend 2001" by Mike Greehaus. 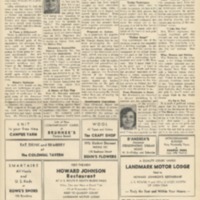 The article mentions Lively Lucy's Folk Festival which took place on Saturday of Spring Fling. The folk festival is described as relaxing. "Community Profile: Josh Clayton" by Laura Martin. Profile of student musician and visual artist Josh Clayton. 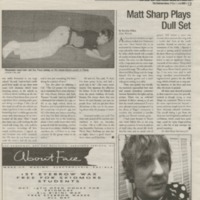 The article mentions that Clayton will not be playing at Lively Lucy's anytime soon because he does not view himself as a performer. "Small Jazz, Long Night, Big Fun," by Deb Kamin. 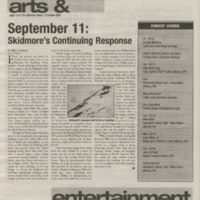 Article reviewing a recent Jazz performance at Skidmore. 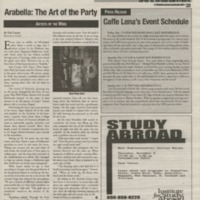 The article mentions the performances of many of the same artists at Caffè Lena earlier in the year. Schedule of upcoming concerts in the Saratoga are including "Kennedys" at Caffè Lena. Schedule of upcoming concerts in the Saratog area including "Torey" at Caffè Lena. Schedule of upcoming concerts in Saratoga including "Eddie From Ohio" at Caffè Lena. "Artist of the week: Jason Domnarski," by Ben Fleisher. 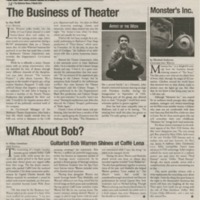 Article discussing student musician Jason Domnarski. Mentions that with his band, Jason Domnarski performs at Caffè Lena. 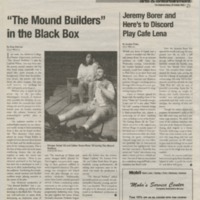 "Jeremy Borer and Here's to Discord Play Café Lena," by Jocelyn Polen. Review of Jeremy Borer's performance at Caffè Lena. Schedule for upcoming concerts in the Saratoga area including "Pierre Bensusan" performing at Caffè Lena. 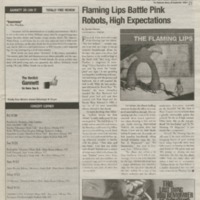 "Artist of the week: Tim Peck" by Chriss Ladd. 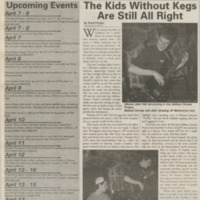 Article focusing on student musician, "Tim Peck." 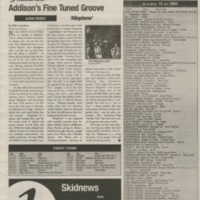 The article mentions that he will be playing at Caffè Lena with the Skidmore Jazz Ensemble. List of upcoming concerts in the Saratoga area including "Pierre Bensusan" at Caffè Lena. "Quick Work of Falstaffs" by Erin DeCou. 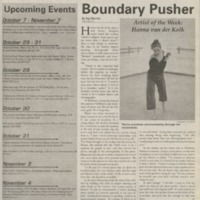 Review of Ember Swift's show at Falstaff's. 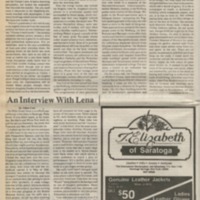 Mentions that Swift performed in Saratoga Springs once before at Caffè Lena. 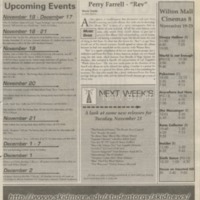 Schedule of concerts in saratoga including "Amy Fairchild" at Caffè Lena. Schedule of concerts in Saratoga including "Tom Rush," "David Wilcox" at Caffè Lena. 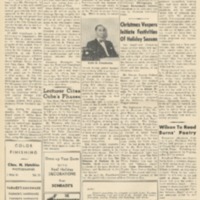 Schedule of concerts in Saratoga including "Colleen Sexton," "Don and Victoria Armstrong," "Ember Swift." 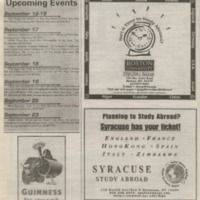 Schedule of concerts in Saratoga including "Peter Mulvey," "Slaid Cleaves" performing at Caffè Lena. 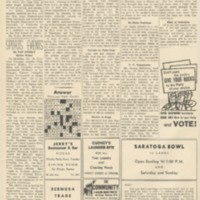 Schedule of concerts in Saratoga including "Camille West," (listed twice), "Laura Simms." Schedule of concerts in Saratoga including "Steve Gillette and Cindy Mangsen," "Karen Savoca," "Matapat." 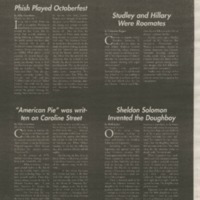 "'American Pie' was written on Caroline Street" by Mike Greenhaus. 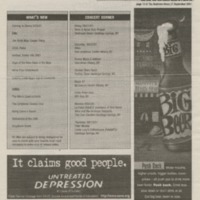 Article discusses how Don Mclean wrote the song "American Pie" at Saratoga Springs bar, Tin & Lint and then performed the song for the first time at Caffè Lena. 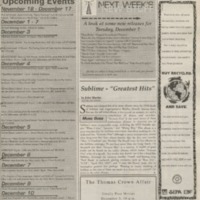 Schedule of concerts in Saratoga including "Susan Trump" performing at Caffè Lena twice. 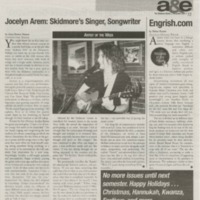 "Jocelyn Arem: Skidmore's Singer, Songwriter," by Anna Brown Massey. 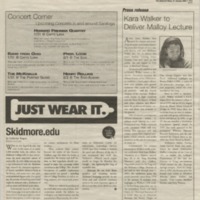 Article about Jocelyn Arem, her love of music and commitment to several activities on Skidmore's campus. 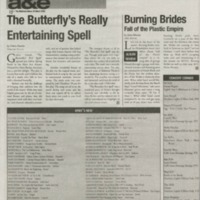 The article mentions that Jocelyn has played at Caffè Lena. 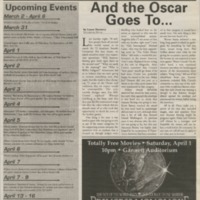 "Caffè Lena's Event Schedule: Lists: "Tanglefoot," "Sarah Lee Guthrie and Johnny Irion," "Lisa McCormick," "Bill Morrissey." 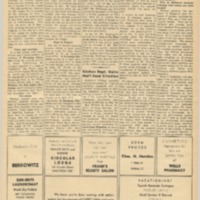 Press release talking about Caffè Lena and listing upcoming performances by: "Newton Street Irregulars," "Bill Keith and the Upstate Bluegrass Band," "Sloan Wainwright, Ina May Wool, and Anne Heaton," "Six Poets at Seven." 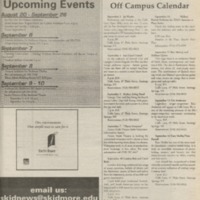 "Caffè Lena's Event Schedule" Lists: "Skidmore Jazz Ensemble," "Bob Warren," "Tish Hinojosa." Schedule of concerts in the Saratoga area including "Eric Anderson," "Tom Lewis," and "Flapjack Caffe Lena." Schedule of concerts in the Saratoga area including "Brooks Williams" and "Meg Hutchinson" at Caffè Lena. Schedule of concerts in the Saratoga area including "Aztec Two-Step" at Caffè Lena. 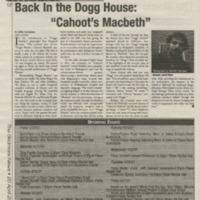 "Back in the Dogg House: "Cahoot's Macbeth," by Mike Greenhaus. 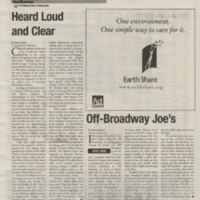 Review of "Cahoot's Machbeth," performed at Caffè Lena. 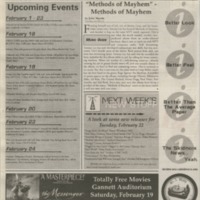 Schedule of events happening around Saratoga including one event happening at Caffè Lena : "Cahoot's Macbeth" (listed three times). "Rick Braun (Psst. G-Love went here.)" by Sgt. Pepper. 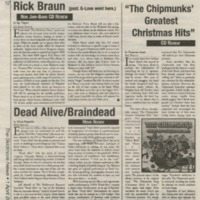 Review of artist Rick Braun's lastest album with mention of artist G-Love attending Skidmore and performing at Caffè Lena. "Caffè Lena Gets Jazzy"By Mikey Greenhaus. 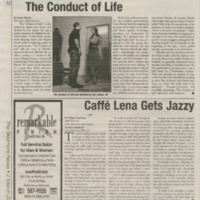 Discusses Caffè Lena and how students lined up to see Skidmore's Jazz ensemble perform at Caffè Lena. 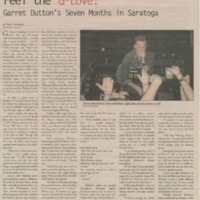 "G. Love Went to Skidmore," discusses artist "G. Love," and how he attended Skidmore for two years before withdrawing. 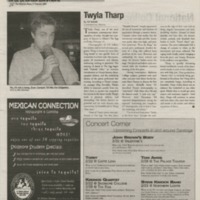 The article mentions that he did return to play a show at Caffè Lena. 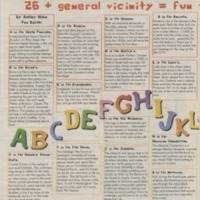 Alphebetical listing of several recommended places to visit in town. "L is for Lena's." Mentions Bob Dylan, Arlo Guthrie and Don Mclean performing at Caffè Lena and how it is the oldest operational folk venue. "Mafia?! Isn't that a movie?" 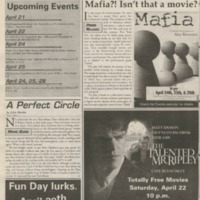 Press release for a performanceby Alex Brewster of the play, "Mafia" happening at Caffè Lena. Schedule of events happening around Saratoga including three events happening at Caffè Lena : "A Celebration of the Pennywhistle," "Woods Tea Company," "Mafia." Schedule of events happening around Saratoga including three events happening at Caffè Lena : "Bob Franke," "Peter Mulvey, "Vance Gilbert." Schedule of events happening around Saratoga including three events happening at Caffè Lena : "Tao Rodrigues Seeger/ Johnny Irion," "Amy Frandon/ Artie Traum," "Irene Kelly." Schedule of events happening around Saratoga including three events happening at Caffè Lena : "Garnet Rogers," "Mikhail Horowitz & Gilles Malkine," "Cole Broderick Quartet." Schedule of events happening around Saratoga including three events happening at Caffè Lena: "George Wilson," "Christopher Shaw," "Victoria Bouffard." 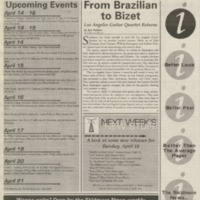 Schedule of events happening in and around Saratoga including three events at Caffè Lena: "Peggy Eyres and Bill Smith," "Aztec Two Step Together Again!" 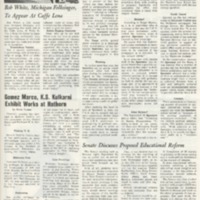 "Patti O'Brien Melita." 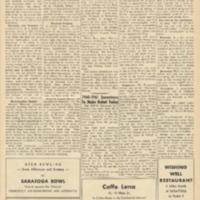 Schedule of events happening around Saratoga including two events at Caffè Lena: "John Herald," and "Camille West." Schedule of events happening around Saratoga including three happening at Caffè Lena: "Pamela Means/ Kris Delmhorst," "David Hamburger Trio," and "Spring Hill Chamber Ensemble." Schedule of events happening around Saratoga including three events happening at Caffè Lena: "Beatles Night: Featuring Bob Warren, Addie & Olin, Leslie Ritter & Scott Petito, Mikki Bakken," "Sweetland Storytellers," and "Chriss Huff." Schedule of events happening around Saratoga including three events happening at Caffè Lena: "Brooks Williams," "Celtic Night," and "Three Part Invention." Schedule of events happening around Saratoga including four events happening at Caffè Lena: "Lou and Peter Berryman," "Bill Keith and Upstate Bluegrass," "Willie Porter," and "Katherine Quinn/ Kevil Mullaney." Schedule of events happening around Saratoga including three events happening at Caffè Lena: "Jane Henshaw," "Judy Wyle & Hidden River" and "Jody Kessler." Each show costs $9-$10. Schedule of events happening around Saratoga Springs including a few concerts happening at Caffè Lena. "Contemporary Folk Duo Terri Roben and Maria Caccavo-Piedmont" and "Don Gaylord and Paddy Kilrain"
Schedule of events happening in and around Saratoga. Includes a few events happening at Caffè Lena including Kelly Joe Phelps and Chris Brown and Kate Fenner. 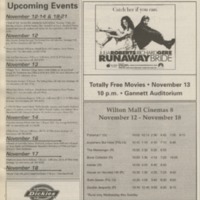 "Upcoming Events." List of upcoming performances, many occurring at Caffè Lena. Performances include Ian Bruce, Sally Rogers, Bob Franke, Sandy & Caroline Paton, Gloria Jean and Mark LeGrand, Rosalie Sorrels. 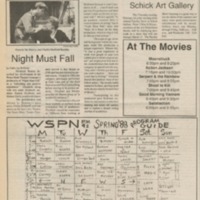 WSPN radio station schedule. Listed on Saturday from 12-3 is Caffè Lena show. "Night Must Fall," by Catherine Robbins. 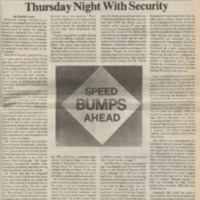 Article discussing Home Made Theatre Company's production of "Night Must Fall." 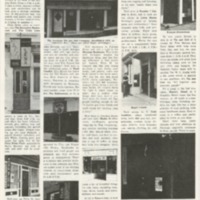 Article mentions that Home Made Theatre Company used to be located at Caffè Lena. WSPN radio station schedule. Listed on Saturday from 11-2 PM is a Caffè Lena radio show. 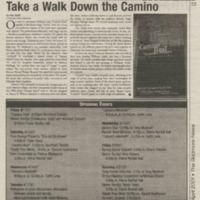 "In and Around Town," mentions an upcoming performance of Gamble Rogers at Caffè Lena. "Carl Landa:" by Emily Bickford. 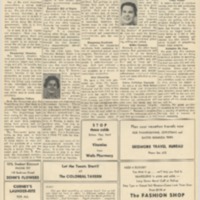 Article about the music of Carl Landa and his performances at Eartha's kitchen on Phila Street. 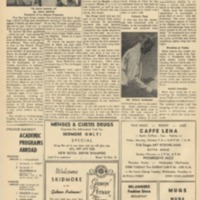 The article mentions that Eartha's is below Caffè Lena. "Profile On Foster," by Emily Bickford. Profile on Jonathan Foster who created the Home Made Theater. The theater is hosted in Caffè Lena on the stage in the back of the coffeehouse. 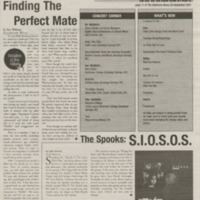 "WSPN: The Listening Alternative." 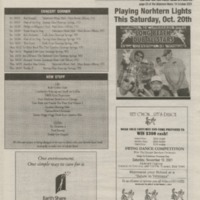 Article describing the various shows that are featured on WSPN radio station and how half of the DJ's are Saratoga Springs community members. One show, "Lena's Open Door," features folk music. 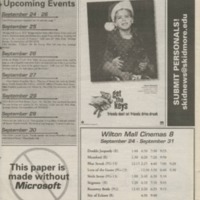 "In & Around Town." 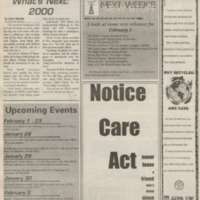 Article describing several events occurring at Caffè Lena including a performance by The Rude Girls and "'open mike night'" every Thursday. "Home Made Theater to Hold Auditions." 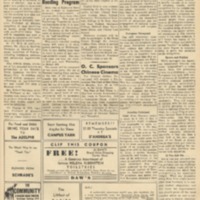 The Saratoga Home Made Theater was intending to hold auditions for the play "You Cn't Take It With You" by George S. Kaufman and Moss Hart. The auditions were set to take place in the theater at Caffè Lena. "Jazz Weekend at Café Lena." The article explains that two Jazz musicians will be coming to Caffè Lena that weekend. 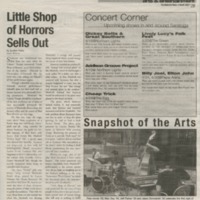 The article then describes the two musicians, Jeremy Steig and Eddie Gomez and their musical styles. 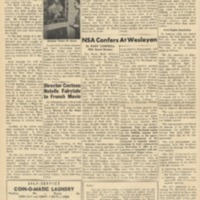 "New Theater Company," article announcing the creation of Home Made Theater which will be presented on the stage at Caffè Lena. 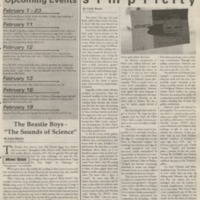 "Student Lauds Gallery Presentation; 'Three by Tennessee' Shows Talents" By Betsy Goldberg. 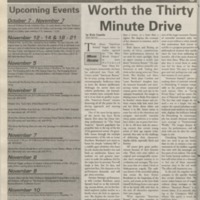 Article reviewing Tennessee Williams's play "Three by Tennessee" performed at Caffè Lena. Advertisement for the "Reverend Gary Davis" at Caffè Lena "An ordained baptist minister, he is 67 years old and totally blind." 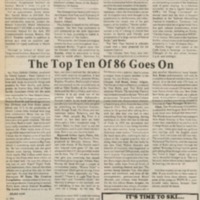 "It's predicted that in a few years his fame will equal if not surpass that of Huddie Ledbetter and Woody Guthrie." 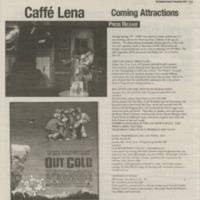 Advertisement for Caffè Lena talking about all of the aspects that the coffeehouse offers, various coffees, teas, pastries, music and relaxing space. Signed Bill and Lena Spencer. Advertisement for Caffè Lena "George Dawson and Rob Hunter"
Advertisement for Caffè Lena "Folk music - Poetry - Jazz" "-Exotic Coffees - Teas - Pastries-" Advertising a show featuring Folk Singer Art Rosenblaum, Guitar - Banjo "Open Tuesday Thru Sunday 5:00 P.M. - 2:00 A.M.
Advertisement for Caffè Lena "Jackie Washington, Maxine Abel, Hootenannhy--Sunday Evening"
Announcement from Bill and Lena Spencer explaining that Caffè Lena would not be opening on the set date of May 13 but instead on May 20th.